This co-branded card by RBC and Westjet has been one of the most popular high-end travel cards in Canada for a few years. It used to have a fairly competitive annual fee of 99 dollars per year but this will be increased to 119 dollars this November. Before November 1st, 2017, this card still has the 99 dollar annual fee with 49 dollars fee for each additional cardholder. Sadly, this card never offered (as I am aware of) any First Year Free (FYF) publicly in the past. But it never hurts to make a call to talk to the customer service and ask for it. 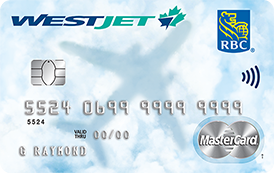 This card comes with 250 Westjet Dollars (WSD) of welcome bonus which only requires one valid transaction after you activate the card.You can use WSD to redeem Westjet flights, whether directly online or over the phone. Each WSD is usually worth of 1 dollar, unless you are looking for member exclusive rates. Any purchases with this card will earn you WSD. According to the description on the official website, If you use the card for WestJet or WestJet Vacations purchases you'll earn 2% of those values in WestJet dollars. All other eligible purchases made on the card earn 1.5% in WestJet dollars. Under the member exclusive fee, you only need 160 WSD+44 tax for a 288 dollars cash ticket. 272 cash price = 100 WSD+51 tax. Each WSD= 2.2 dollars. When you hold the WestJet RBC World Elite Mastercard, you and up to 8 guest travelling on the same reservation can each check your first bag for free. That is normally a $25 saving per person per flight. And the nice thing is, you don't even have to purchase the tickets on your WestJet RBC World Mastercard. The complimentary first checked baggage, 250 WSD of sign-up bonus and annual companion flight voucher are the three highlights of this card. For frequent travelers in Canada, this card is definitely worth having. However, the use of WSD is not so flexible, you do have to spend what you have earned with Westjet again. This card would be even better as the WSD points system keeps upgrade.